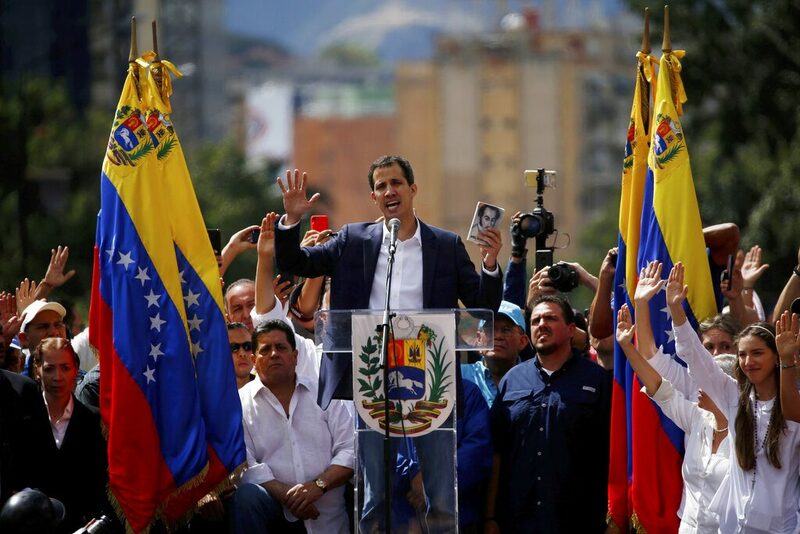 Guaidó, the 35-year-old recently elected head of Venezuela’s National Assembly, took the oath of office on an outdoor podium in Caracas, flanked by yellow, blue and red Venezuelan flags. 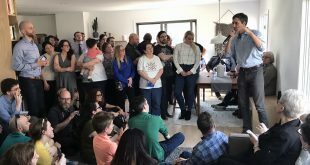 He raised his right hand as a crowd erupted in cheers. He promised to serve as interim leader and call for general elections. Earlier in the day, Guaidó issued a statement urging all foreign embassies in the country to disobey Maduro’s 72-hour deadline and not to remove their diplomats. NPR correspondent Philip Reeves told All Things Considered that the protesters he spoke with on the streets of Caracas on Wednesday were happy, but not ecstatic. Early Wednesday, Guaidó tweeted that protests were underway in Caracas and the coastal cities of Carúpano and Maracaibo, showing that his movement had reached distant locations. He used the protest hashtag #GritemosConBrio, which means “Let’s cry out loud” and also is part of the chorus of the Venezuelan national anthem. Jason Marczak, the director of the Atlantic Council’s Adrienne Arsht Latin America Center, said Guaidó’s movement was stronger than previous pushes to unseat Maduro because the opposition was united around one leader and enjoyed strong support from the U.S. and other nations. “I think in 2017, the protests — there was support for the protest and the opposition, but there wasn’t a tangible mechanism to be supporting. Now there is something to be supporting. Now the international community can recognize the National Assembly as the only legitimate democratic institution,” Marczak told NPR. Under Maduro’s rule, Venezuela’s economy has nose-dived, inflation has soared and basic foods and medical supplies have grown scarce. Millions of Venezuelans have fled the country, mostly to neighboring Colombia and Brazil as well as Ecuador, Peru and other Latin American countries. Most opposition leaders have been exiled, imprisoned or banned from running for office, John Otis reports for NPR. Guaidó breathed new life into the opposition, bringing together followers in town hall meetings called cabildos and pledging to bring about open, free elections. He has urged the military to abandon its loyalty to Maduro, offering amnesty to officers who turn against the president. 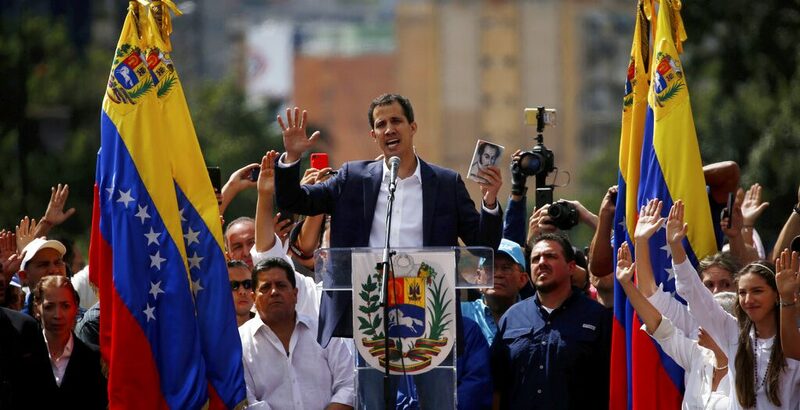 On Wednesday, he repeated his call: “To all the armed forces, our call is very clear, from this parliament we shake your hands and ask you to stand with the Constitution and the people, your people,” Guaidó wrote. Much of the military has so far remained loyal to Maduro even though troops’ salaries have shrunk because of inflation and their equipment has decayed amid the years-long economic crisis, Reuters reports. Maduro also has cultivated senior officers by lavishing them with privileges, including key posts within the lucrative state oil monopoly. Venezuela’s government said Monday it had put down a rebellion within the security forces. Officials said 27 national guardsmen were arrested after they allegedly kidnapped five officers, raided an outpost and stole weapons, NPR has reported. These mutineers were low-level officers, however, Reuters noted. Maduro has dismissed the National Assembly as “a group of little boys” masterminded by Washington imperialists and the far right, NPR has reported. Venezuela’s Supreme Court, packed with Maduro loyalists, has declared Guaidó and the congressional leadership illegitimate. Security forces also briefly detained the opposition leader last week. The U.S., Brazil and the Organization of American States had lent their backing to Venezuela’s opposition before Wednesday’s protests, Otis reports. Vice President Pence extended his support to the National Assembly via a video with Spanish subtitles that he posted to Twitter on Tuesday. “Yankee, go home,” she added in a statement, according to the Telesur news service, which is partly funded by the Venezuelan government.